Among the many avenues that offer progress toward a spiritual awakening, meditation is one of the most powerful tools available on a spiritual path. It’s no coincidence that some form of meditation or another is found in most religious and spiritual practices, but ultimately meditation holds no affiliation with one religion or ideology. It is found in everything from ancient traditions to everyday modern activities. Meditation can work wonders for your health and well-being, providing a potent stress relief, and spiritual growth but sometimes the distractions and chaos of life, combined with a busy mind can make meditation challenging, even seemingly impossible for some people. 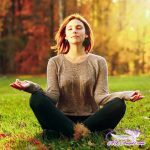 When meditation is coupled with essential oils, much of the perceived challenge or barrier of meditating can be significantly if not entirely reduced. In fact, essential oils have been an important part of spiritual practice and meditation throughout history in cultures around the world. It’s even been uncovered that essential oils were used in ritual and ceremony in Egyptian times, and as early as 3500 BC! In many cultures, essential oils were known to help elevate consciousness to a new level. This knowing was then translated into oils being used for important rituals, ceremonies, and in daily spiritual practice. Frankincense: Known and revered for it’s ability to invoke inner stillness and to promote inner strength and inspiration. Frankincense will help you to lift your vibration so you can experience a deeper connection with Spirit and the higher vibrational realms. It also helps to release negativity, and will guide you to return to your center. Lavender: One of the most versatile and well known essential oils, lavender is truly amazing for bringing a sense of peace and calm to a busy stressed mind. Lavender also helps to bring about emotional balance, it works to clear negative energies, and promotes a deep sense of inner peace. Peppermint: If you tend to want to fall asleep every time you sit down to meditate… Try peppermint essential oil! Peppermint is stimulating and soothing at the same time. It will help to increase your present moment awareness, and can bring about a sense of vitality by clearing stagnation. Peppermint is also incredibly clearing for the respiratory system and can help you to effortlessly focus on your breathing. Joy: A blend of bergamot, ylang ylang, geranium, lemon, coriander, tangerine, jasmine, chamomile, palmarosa, and rose essential oils, joy is uplifting for the mind, body, and spirit. Joy essential oil creates a magnetic energy bringing a sense of love and happiness into your mediation. Lemon: Zesty and refreshing, lemon essential oil lifts the spirit, and will help you to concentrate and gain clarity in your meditation practice. Lemon is calming while still being invigorating, it dispels anxiety and helps the body to relax while remaining alert… Perfect for meditation! Theives: This blend of clove, cinnamon bark rosemary, lemon, and eucalyptus essential oils is most well well-known for it’s cleansing and immune system supportive properties. I have also found it to offer incredibly powerful psychic and spiritual protection, making it a wonderful tool for meditation as well as for promoting overall good health. Stress Away: A blend of copaiba, lime, cedarwood, vanilla, ocotea and lavender essential oils, stress away will help to dissolve away tension and mental rigidity so you can effortlessly melt into a relaxing and rejuvenating meditation. Just like the name implies, this oil will help to melt stress away. How Can You Use These Essential Oils for Meditation? Essential oils offer a pure and high vibration that can help you shift your energy into a peaceful, rejuvenating meditative state. Many essential oils (but not all) are safe and beneficial when used directly on the skin. I personally love rubbing a few drops of lavender on my third eye, or frankincense on my neck and jaw before starting a meditation. A couple drops of peppermint rubbed between your hands and then on the back of your neck is a great way to focus and start your meditation practice. A slight variation of anointing yourself with oil is to simply put a few drops of essential oil between your palms, rub them together, and then bring your hands in front of your nose to inhale, relax, and begin your meditation. Aromatically diffusing essential oils is another great way to uplift your spirit for meditation. The easiest way is to use a diffuser… But you can also add a few drops of essential oil to a bowl of hot water and lean over it deeply breathing in the scent (cover the bowl and your head with a towel for increased effect). Disclaimer! Most essential oils are not food grade and should NEVER be ingested. However, Young Living essential oils are pure, therapeutic grade, and some of them can be taken internally as a dietary supplement. Adding a few drops of Young Living's lemon or peppermint oil to water is a great way to relax and begin to raise your vibration for meditation. Young Living’s stress away blend that I mentioned earlier is also wonderful in water, and a great way to quickly shift your energy if you do find you’re stressed… Or when you simply want a little help shifting into a relaxed meditative state. I personally a combination of all of the above methods to focus my meditations, and bring the high vibrational benefits of essential oils into my daily life. Adding a few drops of lavender and frankincense to a salt bath is an example of a combination of anointing and diffusing that I really love and that leads to a deep and relaxing meditation. When purchasing essential oils, make sure they are of the highest quality and purity, and are therapeutic grade essential oils. You’ll also want to consult the individual oil labels for usage directions… As I mentioned above some Young Living oils can be ingested or directly applied topically. Other’s you will want to be sure to dilute in a carrier oil, or only use aromatically so check with the label. Click Here to learn about the essential oils I use and trust (and to learn about a special offer for Ask-Angels.com readers to get all the oils listed above).